Penobscot Valley Hospital in Lincoln, pictured in 2014. A Lincoln hospital lists debts of up to $10 million and has 1,032 potential creditors as it seeks Chapter 11 bankruptcy court protection to help it reorganize its balance sheet. 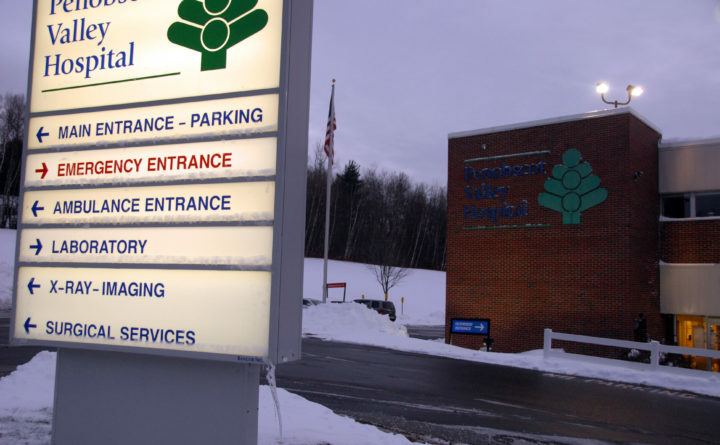 In documents filed in U.S. District Court in Bangor on Tuesday, Penobscot Valley Hospital lists 878 creditors. Hospital attorney Andrew Helman of Portland said there were another 154 former patients that could be owed. Total hospital debts or assets are not specified in the documents and Helman declined to reveal them. The hospital’s top five creditors are owed $7.6 million for loans or disputed Medicare and Medicaid overpayments. — The Maine Health and Higher Educational Facilities Authority, a quasi-state agency that helps health care and higher education organizations borrow money at low interest rates: $322,969 for money it loaned. Hospital officials claim in the bankruptcy court filings that they can rebound with court help. They have cut the hospital’s annual net losses from $1.9 million in 2016 to an estimated $837,104 in 2018, and have cut operating costs from $23.4 million in 2016 to an estimated $19.6 million last year, according to the documents. The hospital sought Chapter 11 protection on Tuesday, and its first-day motions will be heard in court on Wednesday, Helman said. In the motions, the hospital seeks court permission to use cash collateral to fund continued operations, to make its Feb. 8 payroll on time rather than have court action delay it, to continue to use its financial records and institutions to handle finances, and to expedite court hearings. Hospital officials have already said that no layoffs are planned, and the hospital’s 164 workers will continue to receive their paychecks. While the court’s rulings on the motions won’t be known until they are heard, the motions are routine in Chapter 11 cases, Helman said. On Tuesday, hospital officials blamed a declining patient volume for their financial state. The hospital has seen in-patient admissions drop 65 percent over the last four years, along with a 10 percent decrease in overall patient volume, hospital CEO Crystal Landry said. Its annual revenue fell more than 18 percent between 2011 and 2016, according to Penobscot Valley’s annual I-990 tax filings, to $21.5 million from $26.4 million. The last year the hospital didn’t lose money was 2011.